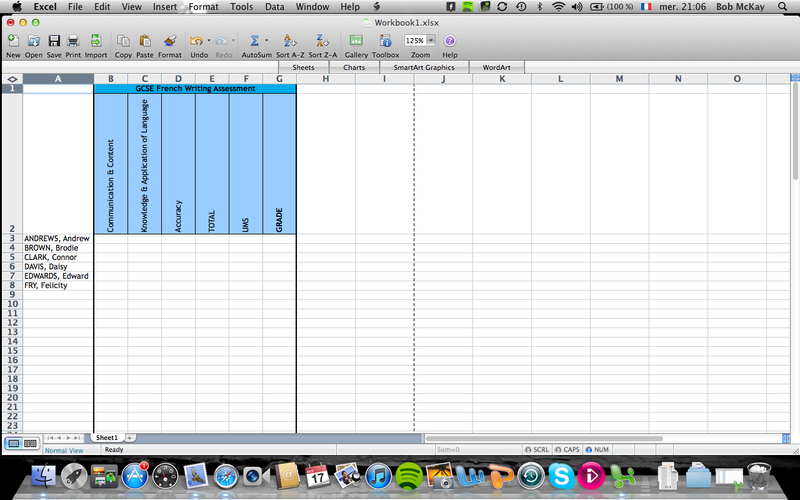 My spreadsheet is set up with columns for students’ names and their marks. The columns and rows are named by Excel with numbers and letters: column A contains the names, columns B, C and D the marks and columns E, F and G the total, UMS and grade respectively. Thus, cell G3 will contain Andrew’s grade for the task. Then press enter. This means that all of the cells between (and including) B3 and D3 will be totalled together in the column containing the formula. You can then copy and paste this into all of the cells beneath (CTRL+C to copy, CTRL+V to paste). 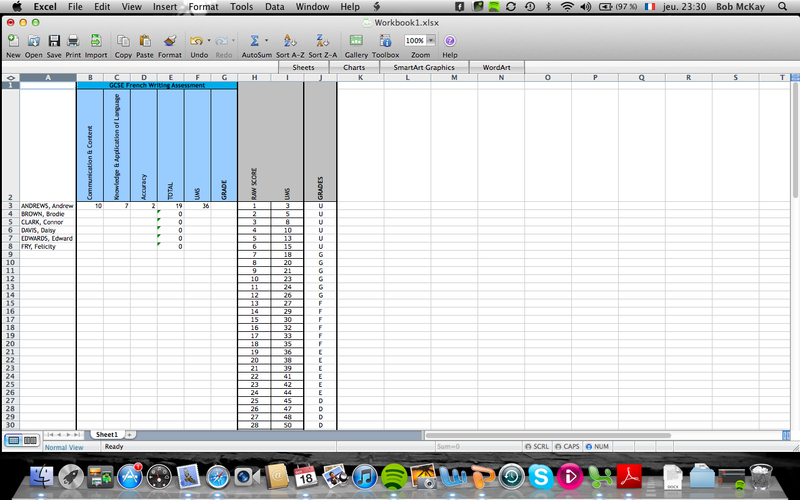 Now, when you type numbers into the first three columns of your sheet, Excel will total them up for you. 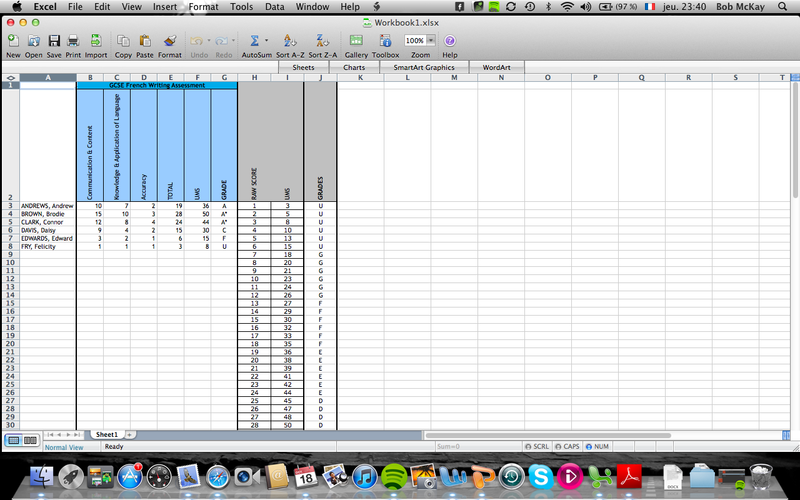 Bear in mind that the total will (logically) show as zero until you input some data. 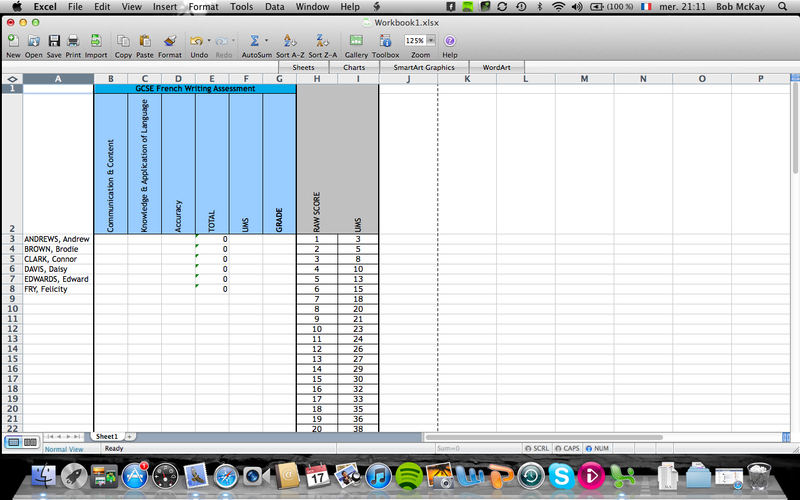 Try putting a ‘1’ into each column and checking that the total comes out as three. Watch out! – B3:D3 is the range of columns I’m totalling in this spreadsheet, but it may not be in yours – check which columns you actually want to total and adapt the formula accordingly. 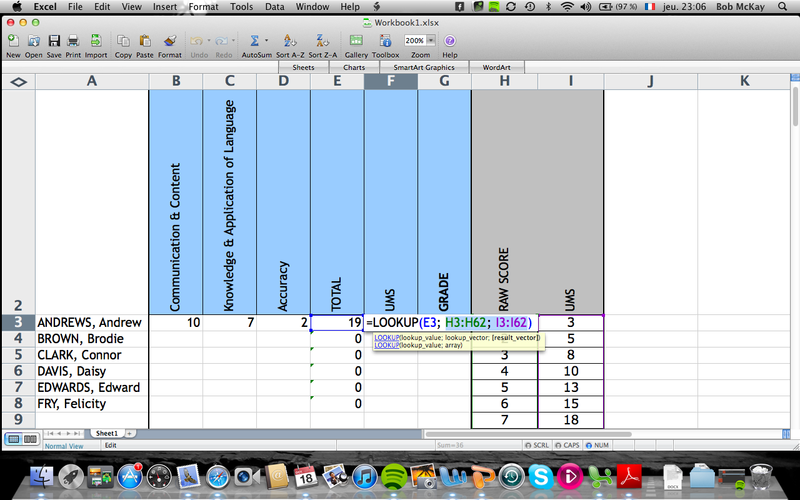 Now, instead of looking up each individual student’s UMS score, you can programme Excel to do it for you. 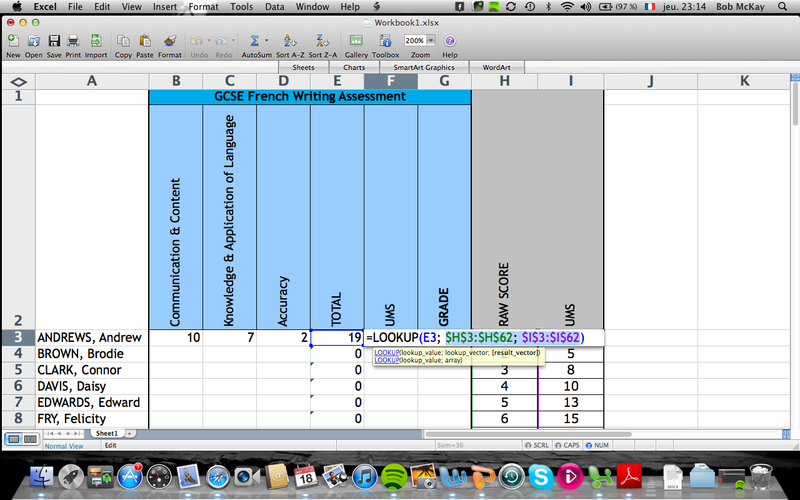 My spreadsheet now contains the exam board’s raw score to UMS conversion data. Beware! The raw scores and UMS must be entered in ascending order for this to work (ie: starting at 1 and working upwards numerically as you go down the sheet). This formula means the the spreadsheet will look up the value in cell E3, find it somewhere between cells H3 and H62 and then display the value in the next column (cells I3 to I62). Thus, if Andrew is awarded marks of 10, 7 and 2, with a total of 19, the spreadsheet looks this value up and calculates the relevant UMS points as 36. Watch out! If you’re using a Mac (like me!) you’ll need to type the $ signs in manually, but on a PC pressing F4 will do that for you. Your formula is now ready to copy and paste into all the cells beneath. Note that I have also inserted *2 next to F3; this is because for the Edexcel French GCSE, students submit two pieces of controlled writing, but we only have the marks for one. I therefore need to double the UMS score as the exam board’s grade boundaries are based on the premise that the UMS are totalled for two pieces of work. Hopefully none of that was too complicated. I’m certainly no genius when it comes to computers, so if I can do it anyone can! If you get stuck, comment below and I’ll see if I can help!